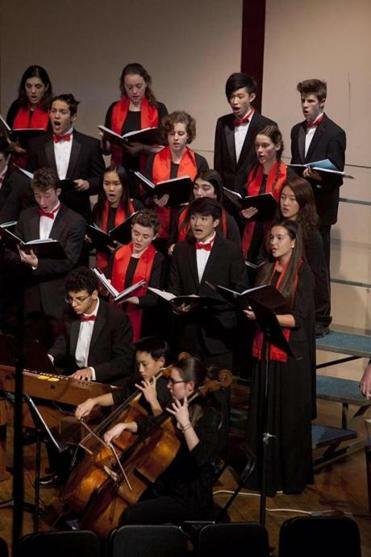 When the Camerata Choir and Chamber Orchestra take the stage at Brookline High School on Wednesday evening, the students will be performing a piece of music written in the Italian Baroque style that hasn’t been heard in public since the early 1700s. The work was uncovered by Brookline High’s director of choirs, Michael Driscoll, who was able to get a CD of the original score, written in what is believed to be the composer’s hand, sent to him from the German museum where it is now stored. “It’s exciting to hear, and I think the students have been excited to learn and perform it,” Driscoll said. The high school musicians and singers will be bringing back to life music that had been forgotten in the basement of a Catholic church in Germany from the mid-1700s until being moved in the early 20th century to the Saxon State Library, where it remarkably survived the bombing of Dresden during World War II. The piece, Dixit Dominus, a setting of Psalm 109, was written in 1719 by Italian composer P. Tomaso Ingegnieri, according to Driscoll, who said he discovered it while researching the Dixit Dominus works of Bohemian composer Jan Dismas Zelenka as part of his doctoral work in choral conducting at Boston University. The piece was part of Zelenka’s collection of about 80 works, which he edited and arranged for the Court Chapel in Dresden, Driscoll said. Driscoll said the Ingegnieri piece being performed at the Masterwork Concert sounds similar to the work of Vivaldi, whose “Magnificat” will also be performed. Tickets for the 7:30 p.m. event at the Brookline High School Atrium are $5 and available at the door. The 48 members of the Camerata audition for the choir and rehearse three times a week to master the challenging music, Driscoll said. And the bassoon, cello, bass, organ, viola, and violin players are a subset of student members of the school’s orchestra. Kenny Kozol, the K-12 performing arts curriculum coordinator, said this is exactly what the Brookline schools try to offer students. Ellen Ishkanian can be reached at eishkanian@gmail.com.